Epic, the next generation of vendors is proudly presented by AMS. which can be customized to fit a multitude of vending needs and aesthetics of any environment. AMS Epic Snack Machine- To begin with, at only $3995, AMS Epic Snack Machine is a beauty to look at. The sleek new design, multiple color combinations and state-of-the-art innovations makes it vendors’ favorites. It is a beautifully designed intelligent machine that can add to the aesthetics of ant place, wherever it is placed. The AMS Epic Snack Machine can be customized to fit a multitude of vending needs. The combination of blue and silver looks absolutely stunning on the machine and can take your breath away the moment you unpack this master piece. With the transparent display, one can easily buy the food item of their choice. AMS’s famous “SENSIT” guaranteed delivery system comes in all AMS machines. Americans with Disabilities ACT ready. “Energy Sensit” – Energy saving device built into the machine. Saves you $$$. 3 Year warranty on parts with the exception of fluorescent bulbs, glass, and paint finish. Shipping not included. A&M is a certified factory distributor for Automatic Merchandising Systems. Our telephone technical support and parts team will be happy to assist you with any issue you may have Monday – Friday 8am – 5pm EST for as long as you own the machine. 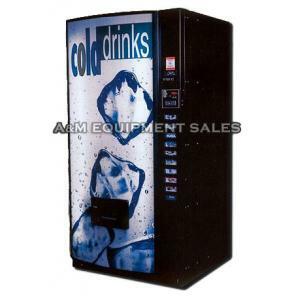 A&M Equipment Sales has been part of the vending industry since 1964. With well over 50 years of experience, we are one of the leading manufacturers and distributors in the industry. Give us a call with any question.